Heavenly scented and charmingly petit, these Clove Pinks add old world charm to gardens and containers. Our four varieties offer a nice selection of color and heights. Dianthus gratianopolitanus Nova (pictured top left) sprawls its silvery gray stems and deep dark pink flowers to about a foot. 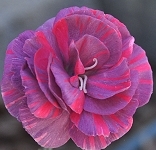 Plant it at the edge of a hanging basket and it will flow over the edge providing care free color and spicy scent. Dianthus gratianopolitanus Firewitch (pictured top middle left) was the 2006 perennial of the year. More compact, but still fragrant, than Nova it reaches only about 6 inches and has incredible pink flowers that go well with blues. Indeed the foliage is a bluish-silver which is very eye-catching in the garden. 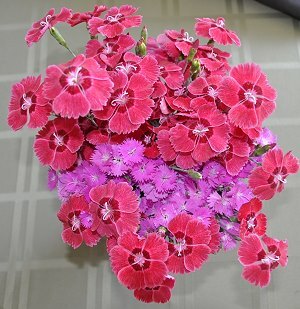 As the bouquet shows, there is quite a difference in the size and color of these two fragrant dianthus. The large pink flowers are the Nova and the smaller purple flowers are Firewitch. Dianthus gratianopolitanus Tiny Rubies (pictured top middle right and to the left) is so small Barbie would be right at home with it in her garden. It also makes a nice groundcover for us giants. The teeny pink flowers cover the light green tufts which spread to about eight inches or more as time goes by. It is only about two or three inches tall, depending on how much sun it gets. The sunnier the site the shorter it stays. 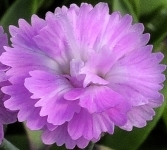 Dianthus caropyhyllus Chomley Farran (pictured on right in the top bar) has a large fragrant outrageously colored pink and lavender flower. 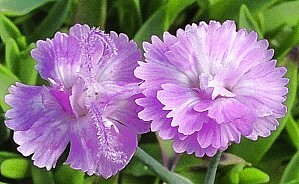 Three inch long silvery leaves and long branches make this one of the largest and most cherished Dianthus. 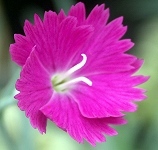 Dianthus 'Nova' (Clove Pink) is one of the six plants chosen to be in our Zone 5-11 Fragrant Herb Garden Six Pack. Chomley Farran is included in our Edible Flower Herb Garden Six Pack. Nova and Chomley Farran also make good additions to our Small Space Herb Garden Six Pack which is a culinary garden. 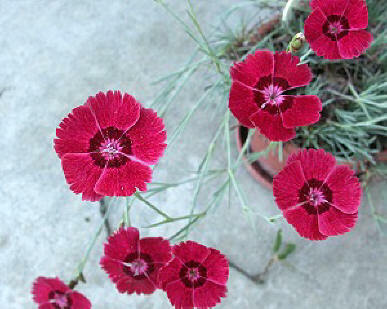 Firewitch and Tiny Rubies are perfect for small space ornamental gardens or containers. These plants are often available in plug trays. These trays hold 128 of all the same plant. They are a great low cost way to fill a lot of space. Each cell is 3/4 of inch by an inch. 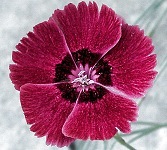 Check here to see if Dianthus Plug Trays are available.